My latest 10 x 10 inch// 25 x 25 cm acrylic on canvas continues my study of singular-focused images against black negative space. This piece features a heavily textured triangle shape that is entirely golden. I took photos of in the light, and so the shine of the black acrylic paint allows the viewer to also see raised texture floating in the blackness. Here (below) is a shot with the brightness turned down, and the contrast brought up to maximum. The painting has a much sexier look with the adjustments- and I think I will (one day) invest in the services of a professional photographer to capture my work. The intent behind this piece was to depict the fading light of a distant dying star. The glow is homogeneous and the texture is as even as I could apply it. It reminds me of a ghostly appiration. Something emerging from the darkness that has an unknown origin. If I could change something about this piece, it would be the lack of clean and sharp lines. I will work on honing my sculpture skills in the next piece. This style needs to be explored, and I have quite a few ideas I’m very excited to implement. Thanks for stopping by, and please check in again soon to see what I have been working on. My latest work is a beautiful, calming, abstract scene. It is a mere 5 x 7 inches, and is entitled: “Tropical Misty Beach”. It is a haunting scene of a thick mist overcoming golden mountain ranges that can be seen peeking through. Gritty texture formed at the base of the mountain range add depth, and continue on to scatter into the deep blue sea. As the texture settles into the sea, green colonies of coral are visible, as if they are poking out from the calm tropical sea’s surface. Perhaps for some, the white misty clouds moving across the landscape are more than condensation; their forms mimic spirits on a diaspora across the land. It’s something my imagination created, and I am interested in hearing what your imagination came up with in the comments section. This piece really moved my sensibilities to feelings of calm and tranquility. My only regret is that I didn’t make this piece larger-perhaps 100 cm x 100 cm. Although I am unsure if bigger would have resulted in better for this abstract style. I have been working with themes lately. I find that having a theme in mind keeps a person like me much more on track. As a creative-type, my process can be wandering due to my constant desire to explore, learn, and try new things. I wanted to capture an imagined view of magma trapped between two giant tectonic plates, by blending blues greens and bright orange with yellow. 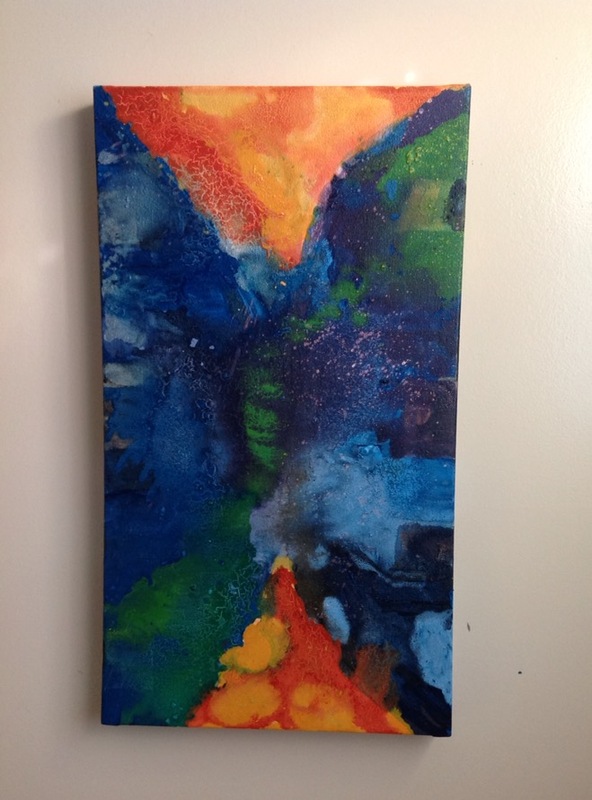 The size is a bit small at 12 x 24 inches. If I could go back, I would had made this a bit larger, as I really like the way the orange magma turned out, and I would have liked to see it spread out on a wider canvas. 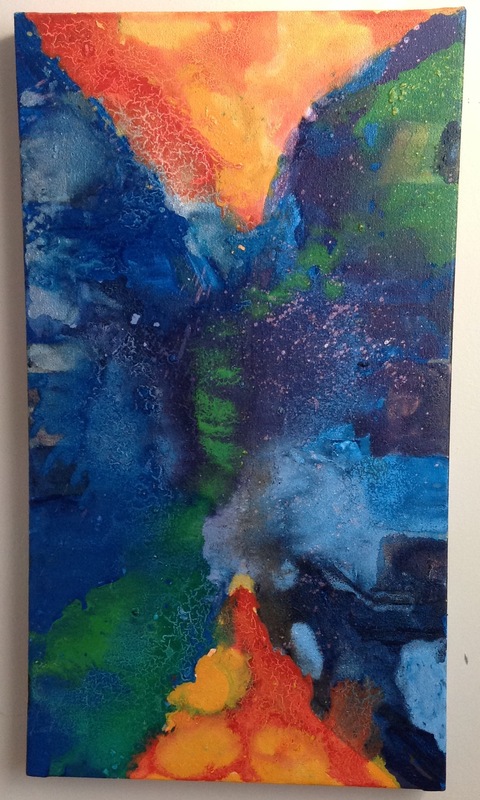 Right now I am enjoying using bright orange to contrast with dark blue in my work, so I am very excited to see how this will evolve in my next few pieces. I have been practicing new techniques with my abstract art. Swirls, clouds, and other effects are what I have been trying to achieve, and as seen above, my pursuits have been pretty good. I still try to focus on effective colour composition- as this is the reason why I started painting in the first place. Grey, blue and gold are the colours I am loving right now; however, I am noticing that dark violet tones are creeping in to my work (seen here). 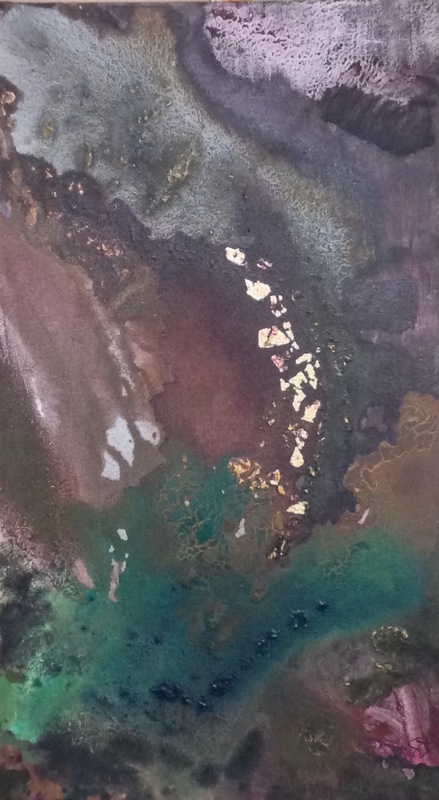 The marbled effect of this 12 X 24 piece is for me: almost breath taking. I say “almost” because I am an outspoken critic of myself, along with the fact that I am in full understanding of the fact that I am very near to achieving the style I am working toward, but have not arrived there yet. In this piece, I gave used acrylic on canvas, with a strong emphasis on dark vs light (perhaps a thematic feature of most of my work?). Texture and relief are present. Gold is splashed within the veins of the work, to represent redemption and I even used sparse bits of gold leaf as well. I wanted to feature this piece specifically because it incorporates lots of gold. I like it so much that I gave it a name;(something I have not made a habit of thus far). It is entitled “Heaven’s gate” as this was the first term that came to my mind when it was completed. I used gold leaf, green and blue acrylic on this 12 x 6 inch canvas. The only qualm I have with this work is that it isn’t as large as it deserves to be (in my opinion). There is some limited relief and texture in this piece, and the blending is quite well executed. I have not sold this piece yet, but even if it doesn’t sell I am happy to have it hand on my wall for as long as I am able to. I snapped this shot on a beautiful November afternoon in Hamilton. I absolutely am an admirer of the architecture seen here at the tops of this row building. I would assume that this was one large building at some time in the past due to the consistent style of windows, and the continuous use of the same decorative brackets and cornices. 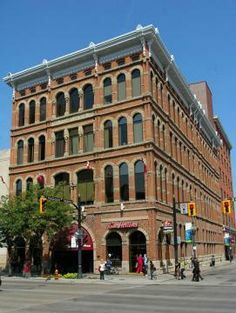 There are a few locations in Hamilton where this style is experiencing a revival- either that or they are borrowing from the existing style of older buildings (like the one you see above) to create uniformity and identity. **Updates** Images of buildings in downtown Hamilton that illustrate the continuity of the architectural style described earlier. I love that you can find the classic heritage buildings with the style; as well as many new constructions. People often ask me: where do you find the time? The answer: you will always find time to do what you love. 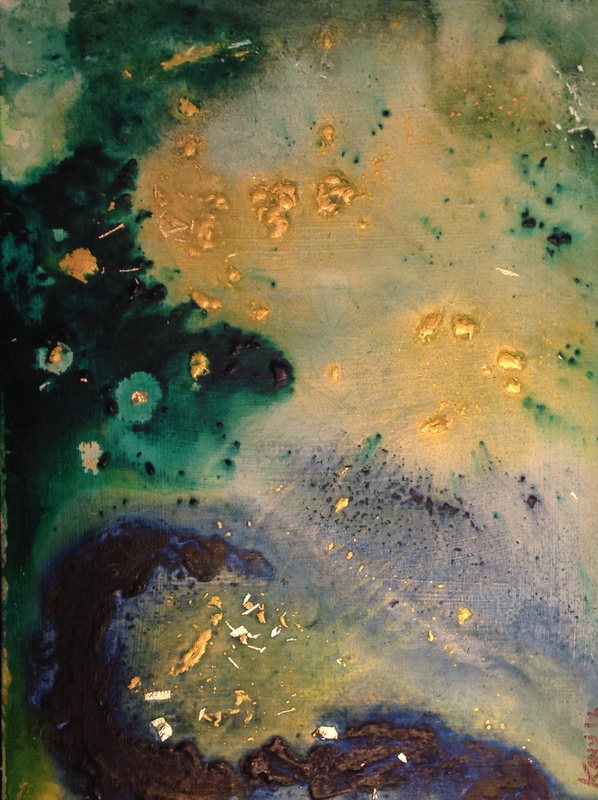 My latest acrylic on canvas: deep gold texture with circular forms.